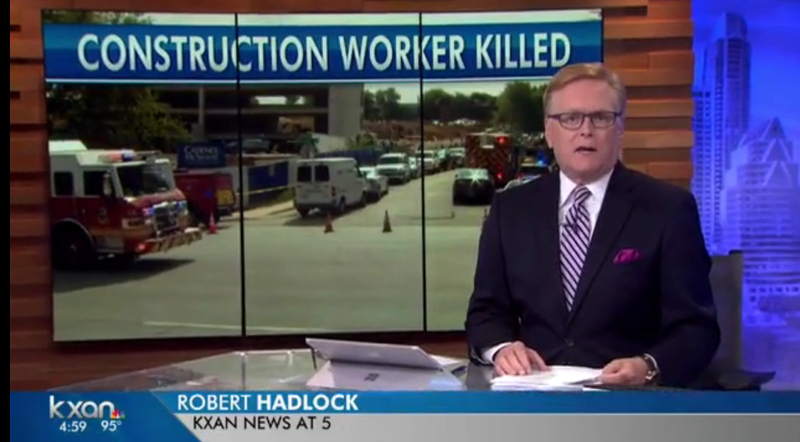 AUSTIN (KXAN) — Even though emergency crews tried to remove a construction worker who was pinned underneath a concrete slab in southeast Austin, the man was pronounced dead about 45 minutes after the slab fell. The Austin Fire Department received the call around 9:15 a.m. from a construction site at Wickersham Lane and Cromwell Circle. When they arrived, they discovered the worker was stuck under 30,000-40,000 pounds of concrete, AFD Division Chief Palmer Buck said. He called the incident a result of a “cascading effect,” and now investigators are working to find out what started the apparent chain reaction. They plan to interview several witnesses and other workers who were present at the time, Austin police spokeswoman Officer Destiny Winston said. Two people with knowledge of the site and construction safety told KXAN it appears a section of the concrete wall being installed on the south side of what will be a parking garage fell over onto the cab of the truck delivering a different kind of concrete slab for the garage. Those interviewed believe that caused a chain reaction that flipped the slabs off the truck’s flatbed and onto the worker. Special operations firefighters, using concrete saws and sledgehammers, “started working through with their equipment to chisel through and get through the concrete,” Buck said. Austin-Travis County EMS said the victim, a man in his 30s, died at the scene. The body was recovered and taken from the site shortly after noon. The parking garage will serve a large apartment complex Cadence McShane Construction was contracted to build. A spokesman for a public relations firm the construction company hired said the victim, who hadn’t been publicly identified as of Wednesday evening, was a subcontractor on the project. The truck carrying the load of pre-formed concrete slabs is registered to an independent contractor in Cedar Park. In a statement, Cadence McShane Construction expressed their sympathies to the man’s family. “Along with other companies working at the site, we are assisting the proper authorities who are investigating this incident,” the statement said. Since 2013, the construction company has been inspected by the Occupational Safety and Health Administration, or OSHA, five times at locations in San Antonio, Richwood, Leander, Pasadena, and Keller. Only one of those inspections, on Oct. 6, 2014, in Leander, resulted in a serious violation. It was settled and the company didn’t have to pay a fine. At least two people wearing OSHA vests were seen leaving the construction site Wednesday evening. Emergency workers couldn’t say what, if any, role the crane played in the incident.